Centuries-old décor, modern art, fashion, and memorabilia outline the Persian rug-covered pathway of DuMouchelle Art Galleries, an auction house in downtown Detroit. There’s an Eames chair in one corner with a footstool half way out, begging to be sat in. Around the bend, Calder paintings hang next to Picasso sketches and 19th-century Pietro Lari watercolors. The space the business occupies is the best of your great-grandmother’s attic multiplied by 10, and it’s celebrating a milestone anniversary. 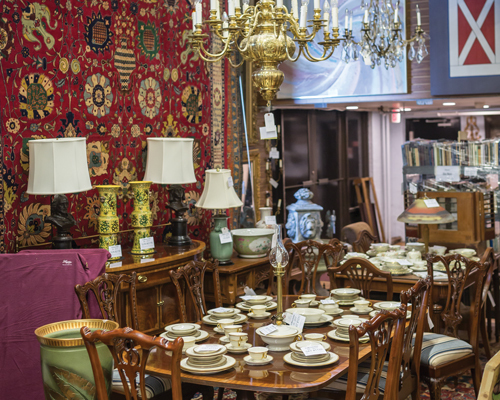 The family-owned gallery and auction house is turning 90 this year. Eighty of those years have been spent at its six-story, Jefferson Avenue location, which is said to have once been the oldest car dealership in the state. The business was started in 1927 by Joseph and Charlotte DuMouchelle shortly after they were married. 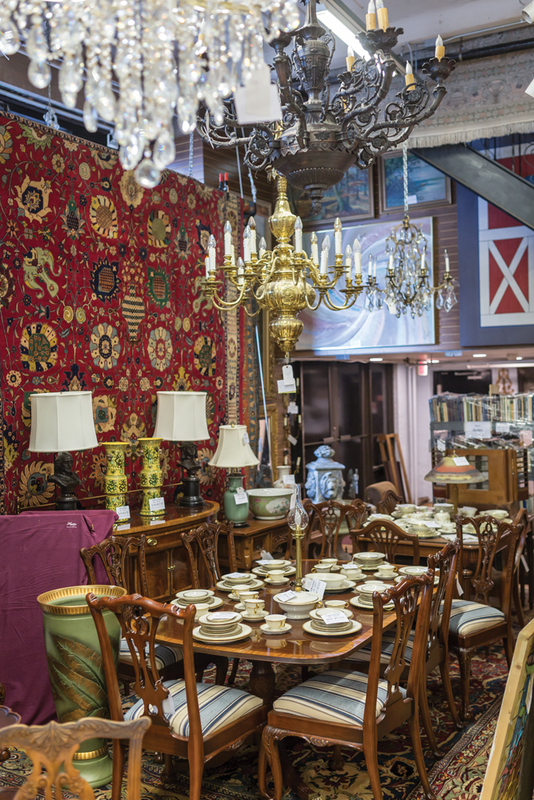 While the items and the space itself skew older — some of its pieces date back to the early 1800s — DuMouchelles has moved into the 21st century. They’re broadcasting live auctions onto many bidding websites, reaching customers from New York to London to Hong Kong and back to Detroit. Operations manager Ryan McCarron and mark-eting manager Max Poole along with an innovative team, also use social media platforms like Facebook and Instagram. Hashtags such as #dwts, an acronym for ABC TV’s competition show Dancing with the Stars for example, can be spotted in the description of a whimsical Harriet Whitney Frishmuth sculpture fountain photo as a way to reach a new, more media-savvy audience. Aside from using new technologies to attract global customers and social media techniques to reach fresh consumers, the business is also capitalizing on the rising popularity of downtown living. “We’ve noticed, at least in the past year, we have a lot more people of younger generations coming through the door,” McCarron says. Co-owner Larry DuMouchelle (far left) is the son of the gallery’s founders. 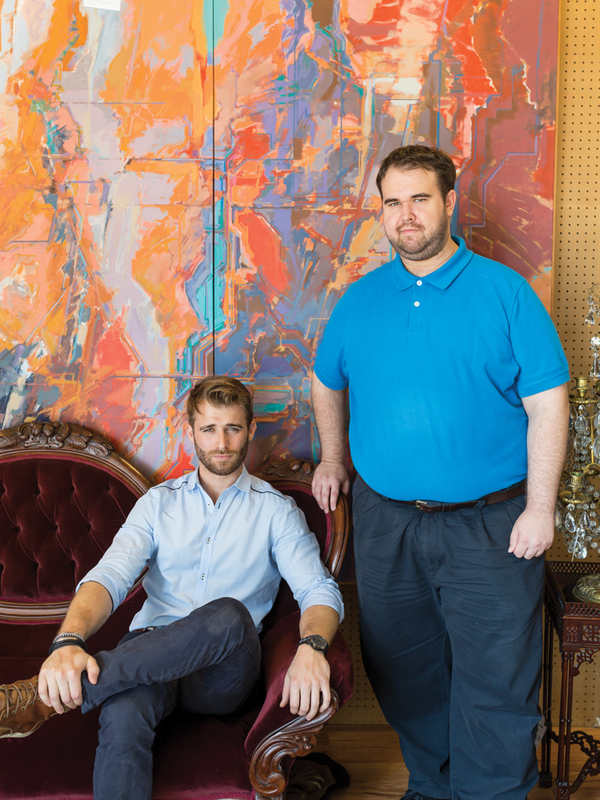 His grandsons Ryan McCarron (left) and Max Poole (right) are part of a multigenerational team that helps keep the 90-year-old business thriving. Yet, while the next generation of employees are using many of their own techniques to move the business forward and continue to keep it relevant, they’re still learning from their seniors about what makes the business successful. 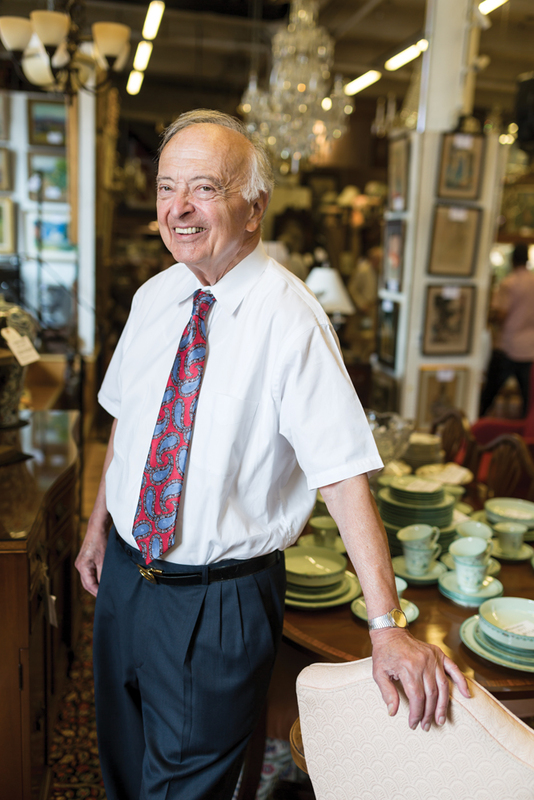 “My father would bring me on Saturdays, and I guess they didn’t know what to do with me so they put me to work,” says Larry, the 83-year-old son of Joseph and Charlotte who now co-owns the auction house along with siblings Ernest and Norman DuMouchelle, and Joan Walker. Over the years, Larry has worked with the estates of the Dodge and Ford families, TV personality Bill Kennedy, and Grosse Pointe’s Stonehurst mansion. Based on his experience at the business — he still comes in for a daily schedule of home visits, appraisals, research sessions with the catalog staff, and even goes on the occasional buying trips to Michigan’s Upper Peninsula — Larry has taught family members including his daughter Nanette, son and general manager Robert DuMouchelle, and grandsons Ryan and Max, the importance of work ethic and making long-lasting connections with clients, many of whom have been coming to DuMouchelles for decades. “We’re now selling for a lot of clients who originally started as buyers. Sometimes the same item comes back to our auctions 30 years later,” he says. The other part is what some family members call a “handshake-and-our-word” mentality that give the business a personal touch, an important part of the competitive auction industry. 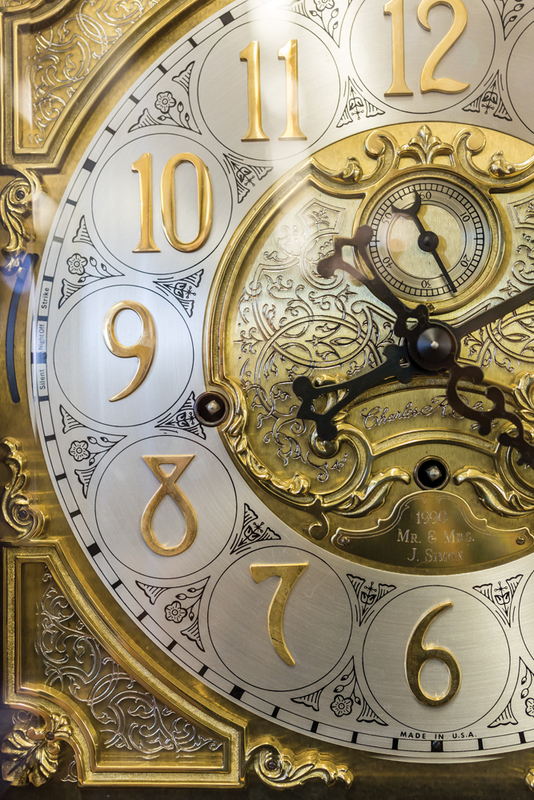 However, from the founding of the business in 1927 to Larry’s words of wisdom and a new approach to client outreach, DuMouchelles has continued to evolve over 90 years of business and beat the odds. The family says most of today’s buyers are not looking for a 150-piece set of porcelain dishes or a 20-foot dining table, like the one in the front window. Yet, while the types of clients and tastes may have changed, DuMouchelles still hopes to act as a liaison for pieces of history, whether it be a giant blue Tiffany glass vase, a colonial-style couch, or a three-dimensional modern painting. 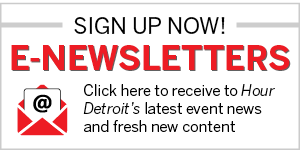 “We’re not only helping decorate homes and apartments; we’re fortunate to be a middleman to pass on pieces of history — of culture, of craftsmanship, of Detroit,” Poole says.